Culture is a challenging thing, especially as an outsider. When we are raised within one, everything seems natural and expected. However, when we throw ourselves into a new culture after having lived our earlier years in a different one, culture can often times be a shock. 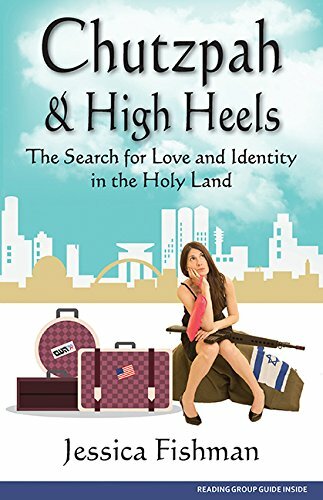 As I was researching for my trip to Israel this summer, I was connected with Jessica Fishman, author of Chutzpah & High Heels , through social media. As I was planning to make my way to the Middle East, our chats were fun and exciting as Jessica — having come from the Midwest herself — had already stuck her heels in the soil. Jessica is a funny, witty and honest writer and her book chronicles her search for herself in one of the Holiest Lands available. Her journey offers insight into the life of a woman, the hardships of finding love in a foreign country, and the truth about the difficulty of going from an immigrant to someone who belongs. When I read Jessica’s book, I couldn’t help but see the parallels between her journey and what it’s like to become a mother. As she is learning the road, so are we. When Jessica’s car broke down and everyone who offered to help was there for themselves and not for her, she phoned a friend. Every mom has a mom friend to call — to cry, to laugh and just to be on the phone with. Often during motherhood we lose our identity. Introductions often describe us as so-and-so’s mom, rather than incorporating details about our life and title before kids. There are challenges on our journey to and through motherhood. They are exciting, exhilarating, scary and overwhelming. And, just as Jessica experienced when moving to a foreign country, there is a new language we must learn — a language to help us communicate with the new life we are building. Chutzpah & High Heels allowed me the opportunity to recognize how every choice we make has an effect greater than the initial response we want — how one choice leads to us making 10 more. We question ourselves, our thought processes, our reason for establishing this life and the choice we made into motherhood. That said, Chutzpah & High Heels is for all woman, in every phase of life. We can all relate to the path not always being as easy to follow as the map it was planned out on seemed. This book was both fun and sad. It allowed me to escape into another world … another place in time … someone else’s life … and see how culture — like motherhood — can be a very tricky thing to fully grasp.